While the role of the polycomb genes in maintaining cellular fate decisions during development is established, their role in maintaining the identity of mature, differentiated cells after cellular activation is less clear. We identified Ezh2 as an epigenetic modifier induced by CD28 co-stimulation, thus connecting an established extracellular cue required for Treg maintenance with an epigenetic regulator of cell identity. Mice with Ezh2-deficient Treg cells fail to maintain immune tolerance, develop multi-organ autoimmunity, and are incapable of resolving inflammation in CNS tissues upon acute induction of autoimmunity (EAE). Ezh2-deficiency selectively disrupts Tregs after activation, severely compromising the Foxp3-dependent gene expression program and Treg lineage stability. Thus, Ezh2 coordinates cellular activation and the maintenance of cellular identity by directly responding to extracellular cues that drive proliferation (CD28 co-stimulation) and functioning with lineage specifying transcription factors (Foxp3) to reinforce the cells’ transcriptional program. 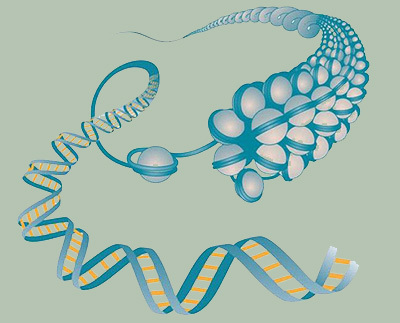 In the context of the adaptive immune system, where the activation and expansion of subsets of cells with unique specificities is essential, epigenetic regulation of the fidelity of cell identity is paramount. This is especially important in the context of inflamed tissues where activated Treg cells must preserve their core gene expression program in the face of a complex milieu of extracellular cues. Importantly, our ongoing work has revealed that mice with Ezh2 deficient Tregs are more resistant to the development of transplantable tumors, supporting the potential for Ezh2 inhibition to treat cancers by acting directly on tumors as well as on the immune microenvironment. DuPage M, Chopra G, Quiros J, Rosenthal WL, Morar MM, Holohan D, Zhang R, Turka L, Marson A, Bluestone JA. The chromatin-modifying enzyme Ezh2 is critical for the maintenance of regulatory T cell identity after activation. Immunity (2015) 42: 227-238. DuPage M, Bluestone JA. Harnessing the plasticity of CD4+ T cells to treat immune-mediated disease. Nat Rev Immunol (2016) 16: 149-163. Wang D, Quiros J, Mahuron K, Pai C, Ranzani V, Young A, Silveria S, Harwin T, Abnousian A, Pagani M, Rosenblum M, Van Gool F, Fong L, Bluestone JA, DuPage M. Targeting EZH2 Selectively Alters Intratumoral Regulatory T Cells to Enhance Cancer Immunity. Cell Reports (2018) 23: 3262-3274.